Here’s the Blogger On Pole™ round-up of London events you can’t miss out on this March. Just to give you that extra FOMO. My second home, the London Dance Academy, is celebrating International Women’s Day (8 March 2018) through a series of events for the LDA Empowerment Week. Celebrate International Women’s Day 2018 with LDA’s Empowerment Week! Including: Burlesque Yoga Workshop 3 Mar 2-4pm with @twistertwirl Loving Yourself First Empowerment Workshop 10 Mar 1.30-3.30pm with @nofisa.caseman Twerk & Tricks Workshop 1 0 Mar 4-5.30pm with @misstwerkology londondanceacademy.co.uk/timetable, our app or 020 3490 1018. A post shared by London Dance Academy (@londondanceacademy) on Feb 16, 2018 at 6:03am PST How? Through dancing, of course. Workshops on 3 and 10 Mar include “Yoga-Lesque” Burlesque Yoga with Samantha O’Neill, Twerk & Tricks with Miss Twerkology Chanelle Hall, and a very special masterclass on Loving You First with certified life coach and LDA pole dance and fitness instructor Nofisa Caseman. Book at londondanceacademy.co.uk/timetable or call 020 3490 1018. Floorplay is everything about pole dancing, minus the pole. Think floor work, lap dance, booty shaking and choreography. Open to amateur, semi-pro and professional dancers of all genders, solos and duos, Floorplay is a competition born in Australia and coming to London on 4 March. Yours truly will be performing. It’s my first proper pole competition so don’t expect too much, but do buy tickets. After all, you might as well see what I’ve been spamming you with on Insta IRL! Is Islington the worst place in Britain to be a woman? On International Women’s Day Islington will host an open conversation between academic researchers and pole dancers about being a woman in the borough. What’s not to like? So why Islington? Because according to a 2017 BBC Woman’s Hour report Islington is the worst borough out of 380 local authorities to be a woman for reasons including housing affordability, education and safety. To understand both the data and the lived realities behind it, Impact Hub Islington has invited the authors of the report from Islington-based NatCen Social Research and artists from Persepolis Pole, a female-led arts and cultural impact project in Islington that aims to challenge public perceptions of pole dance. The academics and artists will reflect on how women’s identities are represented in public, what it’s like to be a female performer in Islington’s pole dance entertainment industry and what kind of change is needed to make Islington a better place for all women. The evening will also feature a performance by Islington-based Miss Pole Dance UK Rachel Tolzman. Tickets are £5 and include organic nibbles ‘rescued’ from Borough Market by Elysia Catering. Becoming Shades serves up a sensory feast of dance, aerial acrobatics, music and fire performances set in Hades’ underworld as Chivaree Circus re-enact their award winning re-imagining of the classic myth of Persephone. Their 8-week immersive circus extravaganza is part of The Vaults’ festival and will run until 18 March. If you are as obsessed with RuPaul’s Drag Race as I am you will be GAGGING to hear that some of the most famous queens will be performing together in London. The line-up includes America’s Next Drag Superstars, kickass queens across various seasons AND the first All Star. Amanda Lepore (not on Drag Race but one of the most drag queens ever). 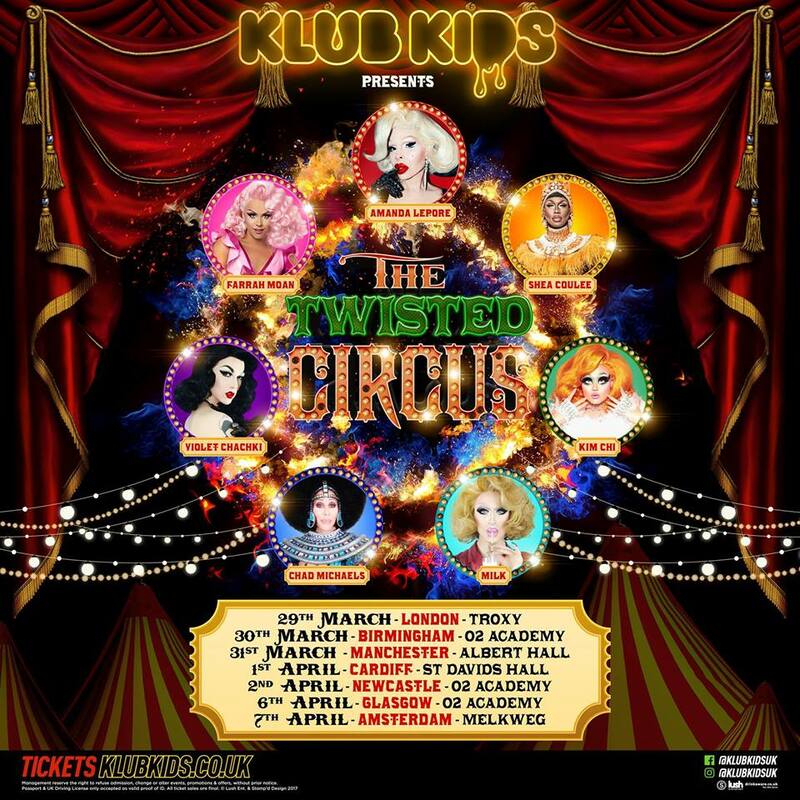 Organised by The Klub Kids gang, this promises to be the biggest and most unique show of drag HERSTORY. Number 90 Bar & Kitchen in Hackney Wick is back again to celebrate its fourth Birthday with its biggest party to date. Taking place over four days from 1 to 4 March, the event will see Number 90 hosting DJs, interactive entertainment and live music, all topped off with delicious food and drink. Each day will celebrate a different theme relating to the world of music, art and dance. Find more info about the event here. Launching at The Vaults in Waterloo on 27 March 2018, An Evening of Meat is a feast of femininity where expressive dance and indulgent food meet to create a mesmerising experience. Cult American director Kate March and her all-female creative collective, I AM, bring their unique mix of choreography, performance art and food to London for a limited run this Spring. 70% Guanaja chocolate and olive oil ganache, sesame ash, coconut bacon flakes and vanilla smoked salt. Vegetarian options will also be available. An Evening of Meat has gained critical acclaim in Sydney, Hong Kong and Berlin. The performance will challenge and engage audiences to play their part in the Art, making this the ultimate immersive dining experience.